Why Is It So Important To Check Tyre Treads? On every set of tyres, there is a tread that surrounds the outside of the rubber section of the tyre. This tread is used for a number of reasons – the main is to grab on to the pavement and get the car moving. Furthermore, the friction caused between the car tyres and the pavement will cause the tyre to melt and rub off on the ground over time. By having the tread in a design where not every inch of the rubber is touching the ground, it helps to put distance between the tyre and the hot pavement and friction. This way the heat can temporarily escape through the tread, and help to keep the burn rate of the tyre much lower. Tread on the tyres of your vehicle also helps to keep you safe throughout the worse weather conditions of winter – and well just about every other season in the United Kingdom! How Can Worn Down Tyre Treads Be Dangerous? 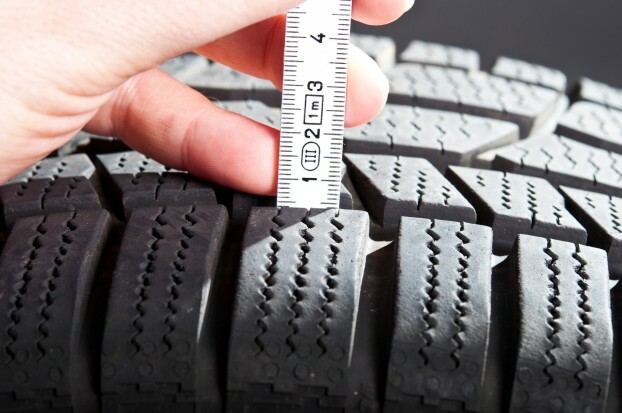 As you utilise your car throughout the year, you will notice that your tread begins to become worn down. The rubber will burn off and end up on the pavement due to friction and heat that is created from driving. As previously mentioned, the tread is a safety feature of the vehicle. Once the tread begins to be worn down, it is important for you to schedule the routine maintenance in order to know how soon you will have to replace the tyres. Having worn down tyre tread can be dangerous for a number of reasons. However, the most pressing reason that having insufficient tread on your tyres can be dangerous is because of the fact that you will no longer be able to get a grip on the ground in bad weather. Rain, sleet, snow, ice, etc. all of these weather conditions on the road impact the safety of your vehicle. If the roads are in a bad condition, and your tyres have insufficient tread on them, then you are really putting yourself in a compromising situation. The tread helps to balance, and stabilise the vehicle on the road. Without the tread you lose control of the car and you risk serious injury, and sometimes even fatality. How Often Should You Change Your Tyres? The frequency of which you should change your tyres depends on a number of factors. The amount of time you spend driving your car, how fast you typically drive your car, how much weight you typically are carrying, and the conditions in which you drive your car, all affect the frequency in which you will have to change your tyres. However, in general, you can expect to need to change your tyres every 40,000 miles in order to keep safe. This is a general assessment that will vary from car to car and car owner to car owner. It cannot be stressed enough how imperative to your safety it is to keep your car tyres safe and in check by frequently checking the tread on your tyres. Louisa Jenkins is a motoring expert. She likes to blog about a variety of motoring issues, such as tyre treads, seasonal tyres and so on.